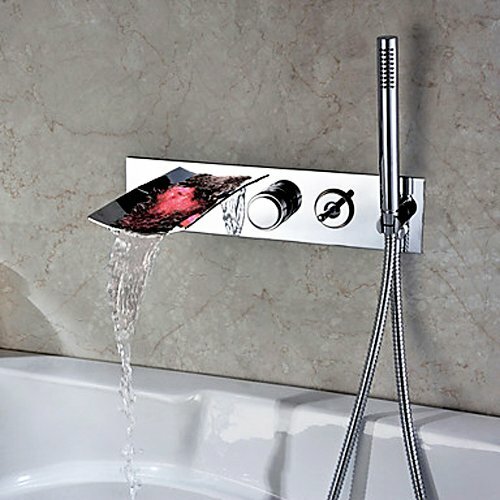 Description: Lovedima Milly waterfall faucet is designed to bring a modern and fun feel into any room. This widespread roman tub faucet features a contemporary style and impressive appearance, which complements a variety of bathroom settings. 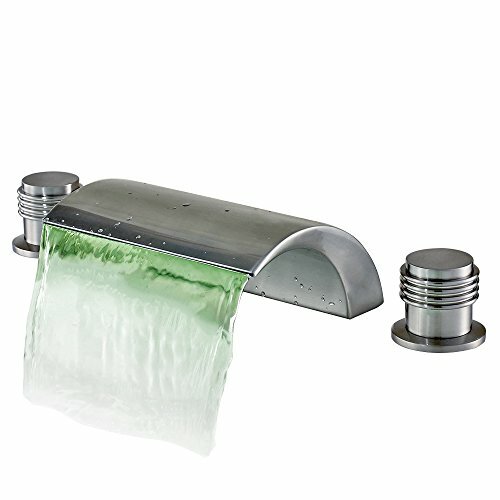 Featured in a lustrous brushed nickel finish, it makes your bath area strikingly beautiful. 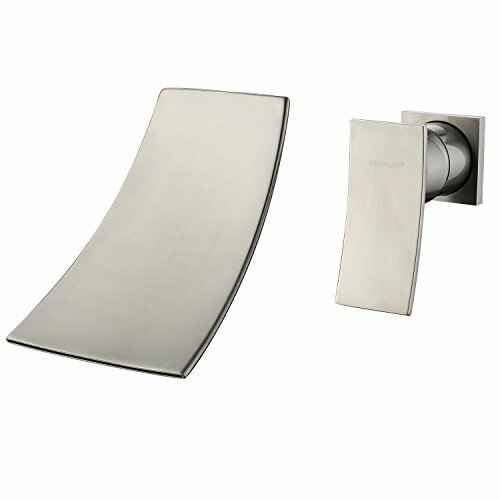 The triple-handle design adds convenience and elegance, making it the perfect addition to any shower. 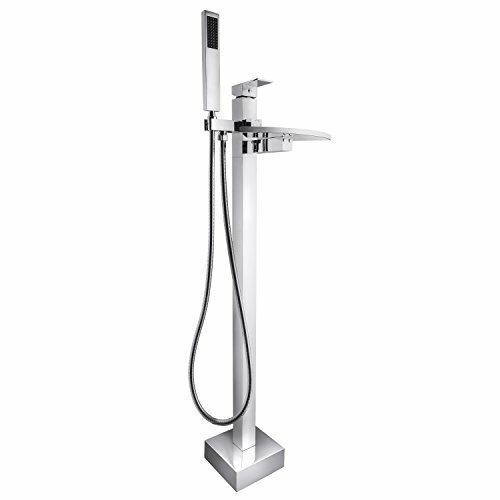 Specification: - Installation Type: Deck mounted - Installation Holes: 5 holes - Number of Handles: 3 Handles - Body Material: Brass - Spout Material: Brass - Handshower Material: Brass - Finish: Brushed nickel - Style: Modern - Valve Included: Yes - Valve Type: Ceramic valve - Cold and Hot Switch: Yes - Overall Height: 5.12" / 130mm - Spout Height: 3.35" / 85mm - Spout Reach: 5.12" / 130mm - Spout Width: 3.15" / 80mm - Faucet Center: Not fixed - Flow Rate: Max 9 GPM / 34 LPM - Drain Assembly Included: No Our Service: Installation instruction is included. It is no hard feeling to install.Please feel free to contact us if you need further information. We will reply within 24 hours. If you order this new product shipped from China, not Fulfilled by Amazon, we will ship it via Air Express, only takes 3-5 days to deliver. 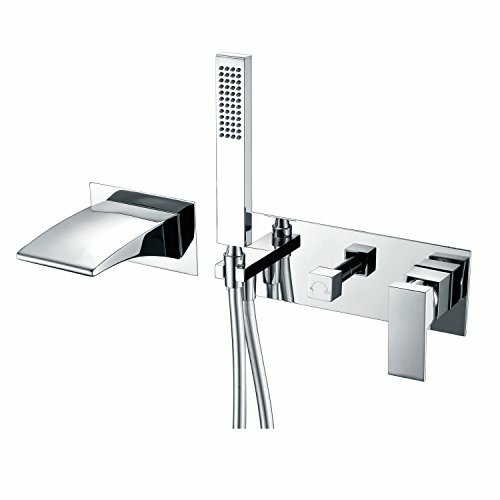 Product Type: Tub Filler Faucets Easy to install wall-mount fixture. Constructed from solid brass for durability and reliability. Feature a unique waterfall spout for an elegant visual appeal. 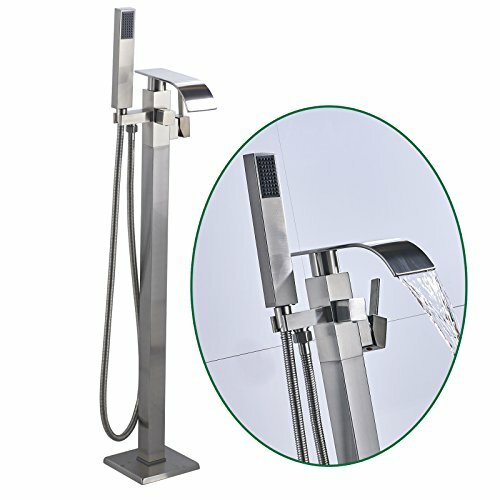 Product Information: Style: Modern/Contemporary Feature: LED, Waterfall Finish: Chrome Body Material: Solid brass Spout Material: Stainless Steel Number of Holes Required: 4 Number of Handles: 2 Installation Type: Wall Mounted Valve: Ceramic Valve (included) Drain Included: No Flow Rate: Max 6 GPM / 22.7 LPM (tub spout); 2.5 GPM / 9.5 LPM (hand shower) The LED light is powered by water flow, and will be activated once the water outflows. The LED light will change its color by detecting water temperature: 0-30°C (32-86℉): Blue 30-40°C (86-104℉): Green 40-50°C (104-122℉): Red 50-100°C (122-212℉): Flashing Red Dimensions: Spout Reach: 6.5" / 165mm Spout Width: 5.12" / 130mmLength of Handheld Hose: 60"/1500mm Package: 1. 1 x Bath tub filler faucet 2. Handheld shower part 3. Hot & cold water hoses 4. Necessary installation fittings Notice: Not suitable for low pressure. Recommended water pressure is 0.3~0.6 MPa (3~6 bar). 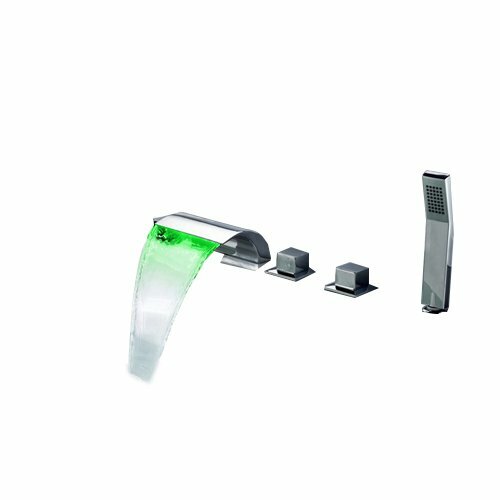 Check if all the fittings are complete before installation. If you need any help, please feel free to contact us immediately. 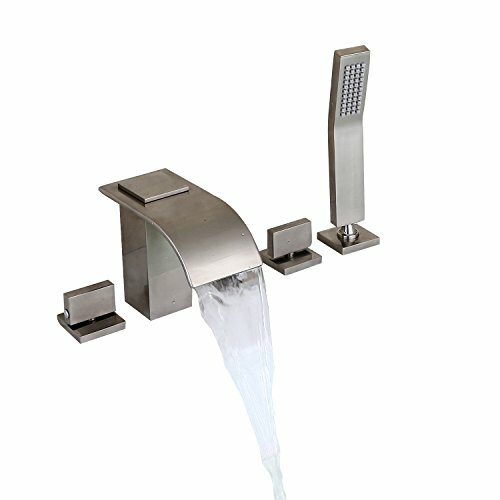 Looking for more Waterfall Tub Filler Faucet similar ideas? Try to explore these searches: Horse Decorative Gift Box, 4 Way Convertible Range Hood, and Earth Elements Mat. How to install a bathroom faucet - Anzzi (KF-AZ127) single lever waterfall faucet.